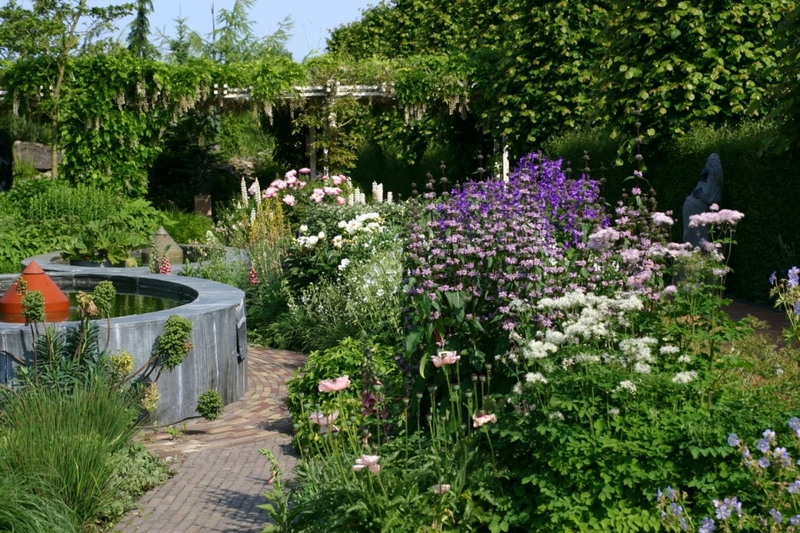 The show and experimental gardens of the garden architect Goedegebuure can be found hidden away on the edge of the town of Nunspeet. From late spring to autumn, visitors are welcomed by a rippling sea of blossoms in a range of colours, shapes and perfumes. Visitors find an oasis of tranquillity and reflection in the different garden spaces, ranging from an old Dutch square with willows, hydrangeas and hostas to a shade garden, shrub garden, moor garden, grasses garden, herb garden, rock garden, rose courtyard and Alhambra. Benches and secluded spots in pergolas, rose arches, greened arbours and arbour walks invite visitors to linger and enjoy the atmosphere. Water is an omnipresent element. Green windows in the tall hedges open up views out into the surrounding countryside. This multifaceted garden is an experimental site for architecture, plants and design materials and continues to develop over the years. Seasonal borders lie like ships in surging seas. Three lead-clad ponds bordered by blossoming flowerbeds welcome the visitor. The shade garden is characterised by ligularia, hosta, astilbe, cimicifuga, rodgersia and many other ground-covering plants such as bergenia, brunnera, geranium and lamium. Most shade plants love moisture so a pond was also created. The garden radiates a natural atmosphere – tranquillity and abstinence in contrast to the boisterous colours of the sunny flowerbeds in summer. The water in the moor garden flows over a fallen tree trunk and then finds its way downward along small rapids and across tree stumps and stones. Marsh plants grow on the banks and ferns and mosses grow over tree stumps and stones. The small hills are made from bails of turf, peat and tree stumps. This has given rise to a biotope where shade plants flourish readily. Unusual varieties which are not used very frequently in gardens but which are nonetheless beautiful flourish under the trees here. They include cercidiphyllum (the katsura tree) with its wonderful autumn colouring. The shrubs include Japanese maples, rhododendrons and other shade-loving ericacaea which like moist acid soil. A collection of rare forest plants such as orchids and arisaemas supplement the current novelties on the market like ferns, helleborus (Christmas rose), pulmonaria (lungwort), epimedium (barrenwort) and many others. Visitors can wander through and enjoy the moor garden by following narrow winding paths. Simple bridges of rough wood ensure that the small streams can be crossed. The bulb garden was created in order to increase knowledge of summer-flowering and autumn-flowering bulbs and tubers and to study the use of this group of plants in gardens. Here visitors can see many (special) kinds – combined with shrubs and hardy plants. When looking for a shape for this garden, the landscape gardener decided upon a diagonal structure to supplement the ovals, squares, circles and classical forms in the other areas. The diagonal pattern of the paving is underlined by using yew (taxus) hedges, thus creating small garden rooms. This garden emerged from the attempt to get to know the various types of grasses better and to try out new combinations. In this garden, visitors can enjoy the rustling sound of the heads and stems as they sway in the wind in summer, appreciate the wonderful colours in autumn and admire the fascinating silhouettes in winter. Visitors will not only find kitchen herbs in the herb garden but also aromatic herbs, herbs for dyeing and medicinal herbs. The wide variety of combinations has resulted in an attractive garden. A visit to the famous Moorish gardens in Granada in southern Spain inspired the garden planner to create Plaza Alhambra in Nunspeet. The Spanish garden is filled with inspiration throughout the seasons due to its classic beauty and large fountain. The atmosphere of Spanish gardens – a combination of classic beauty, colours, high-quality materials and tranquillity – has been transferred to the countryside between Veluwe and the Zuiderzee. Sit down on a bench and enjoy the quiet atmosphere, the tranquillity, the sound of the water and dream of the Spanish sun. The flowerbeds are planted in different colours and are separated by various kinds of hedges. The main flowering season is summer with the red-yellow beds flowering in late summer. Visitors can already see the hilly rock garden from a distance. For the first time, a hill has been used as a garden element in the Netherlands. An exciting geological landscape rises up from the lowland plain. It features hills and valleys, streams and waterfalls, walls, crevices, steps and a grotto. Old English roses, David Austin roses, rose bushes, perpetually flowering modern rose bushes, ground-covering roses, climbing roses, tea hybrid roses and countless rose trees flower here in profusion. Furthermore, experiments are carried out with combinations of trees, bushes, hardy plants and annuals. 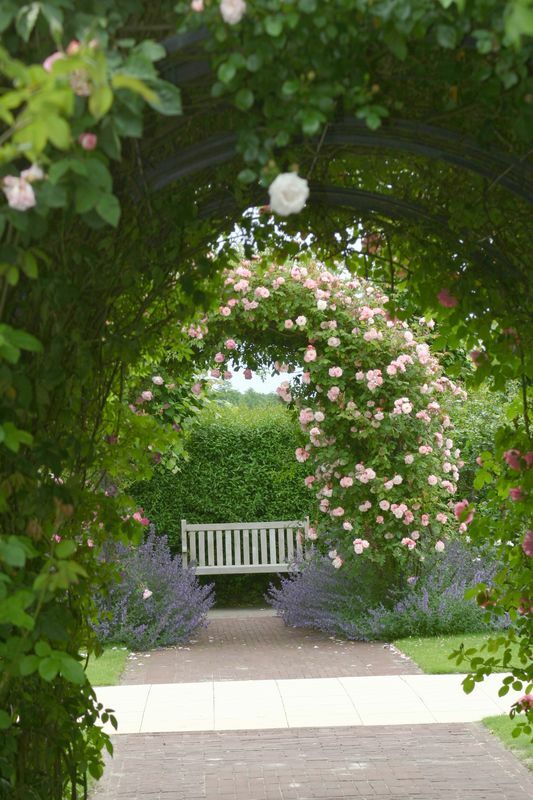 The fragrant atmospheric heart of the rose courtyard is a bench in an arbour covered with roses and clematis. A Wide Variety of Garden Elements Inspire Visitors to Plan Their Own Gardens. A large number of garden elements are on show alongside a wide variety of paving materials. Steps and walls, pergolas, arbour walks, climbing elements, slate structures and other elements of spatial design stand out playfully from the green vegetation. Experiments are also carried out on the use of metals: lead, zinc, rusty iron, galvanised iron and painted wrought iron. These unexpected materials can be found in the garden in the form of tubs for plants, climbing elements, steps and a pergola. Each element has its own atmosphere and aura. Benches and chairs with individual characters invite visitors to linger. Sculptures by artists from the region can be bought here. Information on the surrounding cultural landscape and on other parks and gardens in the vicinity is available in the pavilion. In general: March until October: MondayTuesday to Saturday/Sunday 10:00 – 17:00. Please check the garden’s website for details. Restaurant: Tea and coffee making facilities in the pavilion at the entrance. Restaurants in the village near-by. Accessibility: Nearly all paths are accessible for people with limited mobility.